How are technical reports created? What kinds of technical reports exist? What are the draft stages of a technical report? How do I find out about changes to technical reports? What is the status of a given type of report? How do I access the latest version of a technical report? How do I correctly reference a technical report? What is the relation of a given version of a technical report to a version of the Unicode Standard? What kind of stability can I expect for each type of document? How are technical reports updated? Will old versions be archived? What is required for approval? What are the stages for creating a technical report? What are the stages for updating a technical report? Q: How are technical reports created? A: Technical reports are created by the Unicode Consortium Technical Committees (UTC and CLDR-TC) in a open, consensus-oriented process. The Unicode Editorial Committee is charged with the preparation of the text for publication and is authorized to make editorial changes or corrections. Q: What kinds of technical reports exist? A: There are three kinds of reports: Unicode Technical Reports (UTR), containing informative material, Unicode Standard Annexes (UAX) which form an integral part of the Unicode Standard and Unicode Technical Standards (UTS), which are independent specifications. They are described in more detail in http://www.unicode.org/reports/about-reports.html. Q: What are the draft stages of a technical report? A: As technical reports are developed, preliminary versions are posted for public review. A Draft Unicode Technical Report (DUTR) has been approved by the Unicode Technical Committee for public review. A Proposed Draft Unicode Technical Report (PDUTR) is in the earliest stages of public review. In some cases, earlier drafts may have been working documents in the UTC. A draft of a revision of an existing technical report is identified as a Proposed Update. Q: How do I find out about changes to technical reports? A: Significant updates to technical reports are often submitted as Public Review Issues. As part of the public review process, input from a wide variety of users and implementers is received. When they are issued, public review issues are announced on mailing lists, on the Unicode home page, and via social media. The Unicode Technical Reports index page also lists any drafts or proposed updates that are being considered by the UTC. Q: What is the status of a given type of report? A: Each document contains a status section, giving status information. A UTR normally advances from proposed draft to draft to approved. It can sometimes then advance to Unicode Technical Standard or Unicode Standard Annex. Q: How do I access the latest version of a technical report? A: The latest version is always accessed via the list on the Unicode Technical Reports page or by setting a bookmark to http://www.unicode.org/reports/trnn, where nn is the specific number of the report. Each document also contains a link to itself, using its explicit version number. This link can be used when a reference to that particular version of the report is desired. Q: How do I correctly reference a technical report? A: See the section on Citations and References in Versions of the Unicode Standard. Q: What is the relation of a given version of a technical report to a version of the Unicode Standard? A: Unicode Standard Annexes (UAX) are an integral part of a particular version of the Unicode Standard. That version number is part of the header in the UAX. The other technical reports are not part of the Unicode Standard and have independent version numbers. Several of the Unicode Technical Standards are synchronized with particular versions of the Unicode Standard. Those particular standards use version numbers that match the version numbers for the Unicode Standard. Currently, the Unicode Technical Standard which use these synchronized numbers include UTS #10, UTS #39, and UTS #46. Q: What kind of stability can I expect for each type of document? A: For Proposed Draft, Draft and Proposed Update: These documents reflect work in progress, but their publication implies no commitment by the Consortium or its member companies. They should never be referred to as anything other than work in progress. Implementers creating implementations that conform to a draft document do so at their own risk. For approved Reports, Standards and Annexes: Once a document is approved it will be given a unique version number and stable public location. Implementers can rely on an approved documents, and they may be externally referenced. Q: How are technical reports updated? A: After a technical report has been approved, it may undergo minor editorial revision, mostly to correct any typos or fix problems with the HTML source. From time to time, adding to or revising the technical content of a technical report may become desirable. A draft of the revised report is created and brought before the UTC for approval as a Proposed Update. If the proposed changes are significant, the UTC may call for a formal public review of the proposed update and eventually approve a revised technical report. Each version of a technical report will be numbered sequentially, and all changes will result in a new version number. Q: Will old versions be archived? A: All public and approved versions of technical reports will remain online. Each version of a technical report carries a unique version number and contains a link to the preceding approved version of the document. All versions are stable: once posted, the contents of the file for, e.g., UAX #15, Version 5.0.0 will not be changed, and always found at the "versioned link": http://www.unicode.org/reports/tr15/tr15-27.html. Where technical reports have been superseded, for example by incorporating the material into the published versions of the Unicode Standard, they are sometimes archived offline. Q: What is required for approval? A: Each point of approval requires a majority vote in the UTC. Where previous technical decisions are overturned, a supermajority is required. In most cases UTC decisions are by consensus, with no dissenting votes. Q: What are the stages for creating a technical report? 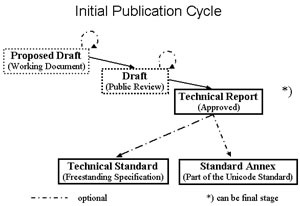 A: The "Initial Publication Cycle" figure below gives a somewhat simplified picture of the principal stages in developing a Unicode Technical Report. While many UAXs and UTSs first existed as a UTR, this is becoming less common. Also, public review may occur already at the Proposed Draft stage. Finally, UAXs or UTRs may be absorbed into the text of the Unicode Standard, and are thereby permanently superseded. Q: What are the stages for updating a technical report? A: These stages are shown in the "Maintenance Cycle" figure below.